Wellington offers myriad choices in live performance options. The new comedy bar VKs brings hilarious stand up comedy line-ups every week, live music open mic nights happen weekly at The Fringe Bar. S&Ms often features spectacular drag queens, Every month Meow hosts Poetry in Motion‘s spoken word poetry night and we are blessed with regular burlesque and cabaret shows like Burlesque Baby, Caburlesque and Cabaret L’Amour. 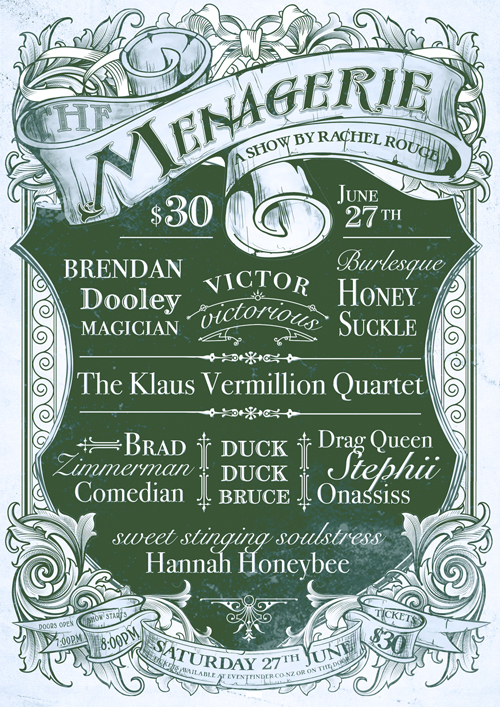 The Menagerie is a variety show that takes a little something from each of these shows and then adds in additional elements of some hard-to-find specialty acts like sideshow, buskers, circus, drag-kings, performance art, contemporary dance, opera or magic. Theatreview said this: “freakishly eclectic mix of talented performers for a truly unique and raunchy variety show.” in their review of The Menagerie’s May show. Wellingtonians are spoiled for choice when it comes to diverse live performance. If they are looking for a small slice of everything with some unexpected extras pack together in one fun show, then they need to look no further than The Menagerie at the Fringe Bar on the last Saturday of the month.